The line between being a reporter and performing a detective’s work is a thin one. This is an example of that. Several people have reported a person missing. Among others, perhaps most notably, mayor McDonough (the mayor of Diamond City), and some anonymous scientists at the C.I.T. that really needs help finding their friend. 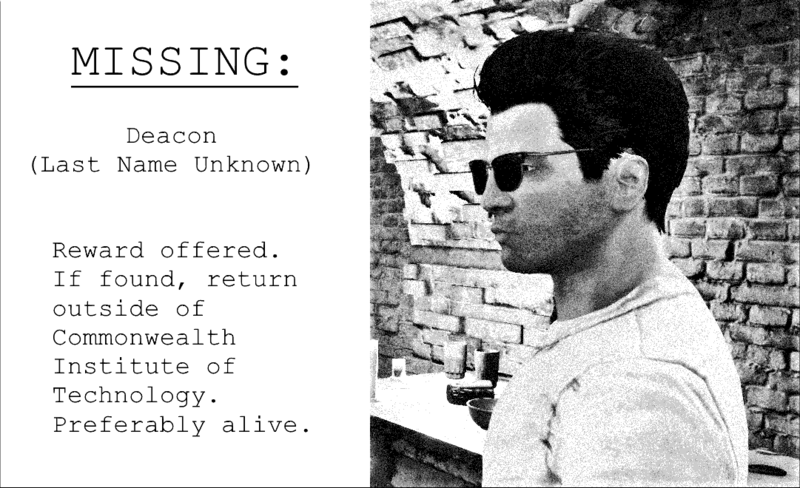 Deacon, the missing person, frequently changes his look, making a visual description difficult. The logical place to begin any search: Diamond City. Unlike the impolite and rather caustic reporter to the left in the image, the security guard was really accommodating. I didn’t even have to enter the city. The helpful gate-security guard remembered hearing about someone resembling Deacon in Bunker Hill. I didn’t get far in Bunker Hill before another helpful individual pointed me in the direction of Goodneighbor. In Goodneighbor’s gun shop, a robot with photographic (Eidetic) memory told me she/it could 100% positively confirm that Deacon was to be found in a memory pod in the Memory Den. I was closing the gap. A guy reclining in one of the pods at the Memory Den told me I just missed Deacon. Unfortunately, the trail turned cold shortly after. After having sneaked around nests of super mutants, gunners and raiders for a while, this character popped up, and offered to help me look. Eventually I got tired of the entire thing and realised it was all a wild goose chase. I came to the conclusion that the man probably didn’t want to be found. Just as well. My newfound companion started to become a bit annoying. He slowed down the entire thing by insisting on doing an outfit change at every turn. If you have any leads on where to find Deacon, leave a comment below, or in the channel of your choice.